It was blessedly cool and cloudy yesterday. It was great! After breakfast at the diner, I pulled some weeds in the garden for a while, then worked on the porch. 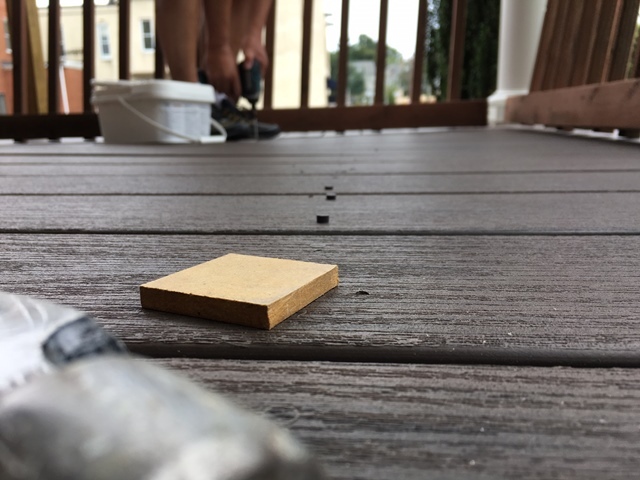 Denis has become an expert at putting screws into the floor boards, so he did that while I hammered in the little plugs that fill the screw holes. There were some snags along the way. Some of the screw heads stripped, requiring the reverse-threaded bits to back them out. The constant drilling was hard on the driver’s battery. Eventually, it’s what stopped the work. We discussed continuing, and working on the steps or cutting the edges of the porch, but we decided to stop. I had some errands to run, and today I’ll be working all day at school. I used the MDF to protect the finish while I hammered the plugs in. Cool photo. Well, you are that much closer to being done! Was the battery just dead, or super-dead? Is that Gus’s perspective? Yes, nice pic! Good idea on the hammer block! You so smart!